on your phone, or on your camera. There's a possibility you've never even noticed your camera, or phone, even has camera modes. They're designed to get the best possible photo from the scene you're photographing, and, these days, as the number of cameras and camera phones grow, the number of camera modes seems to keep growing too. If all you do is load up the camera app on your phone, or just turn your camera on and then simply get on with it, you are probable using the 'automatic' shooting mode. Nothing really wrong with that - it probably takes a half decent photo most of the time. They're in there somewhere, buried in the settings menus. Once you've found them, the next question might well be, what are they all for? Here I've gone through the main shooting modes you're likely to find so that you'll know which one to use, when to use it, and what the camera, or phone, is doing 'under the hood'. First of all, a little bit of explanation about exposure will help. I'll keep it simple on this page, but here's where you can find out more about understanding exposure if you wish. The shutter - your camera has a shutter which opens, exposes the image sensor to light, and then closes again. 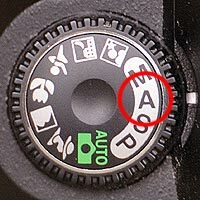 The aperture - this is a hole in the lens that can get larger, to let more light in, or shrink a bit to let less light in. In simple terms, as one gets bigger, the other one has to get smaller to compensate. So ... if you make the aperture bigger, the shutter speed has to get smaller to compensate. How is this relevant to camera modes? 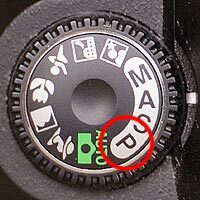 Well, one of the most common camera modes is shutter priority (sometimes called 'time value'). If you have a camera phone it's probably just called shutter priority. If you have a digital SLR it might be labelled 'S' or maybe 'Tv' (for time value) - they mean the same thing. What could be described as the opposite of this is Aperture priority. If you have a camera phone it's probably just called aperture priority. If you have a digital SLR it will be labelled 'A'. ... auto, or, on a digital SLR camera, probably called program, or just 'P'. Because you, the photographer, have no control over what the camera decides is the best shutter/aperture combination, Auto leaves you at the mercy of the camera to get the exposure right. Finally, there's the complete opposite of auto - manual mode. 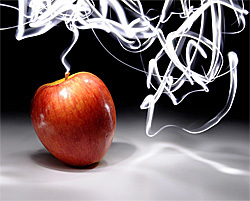 However, if you're using a camera phone the chances are this mode isn't available to you; but you do have other options!